Li Edelkoort already predicted it. The apron is on its return. This return is not a revival however. We move on, from a pure functional piece of fabric into a piece of passion. The New Apron is more than something to wear. It’s a matter of heart and soul. The apron in the 20th century was something we wore because we had to work, without having a choice, a piece to protect ourselves, because we feared getting dirty. 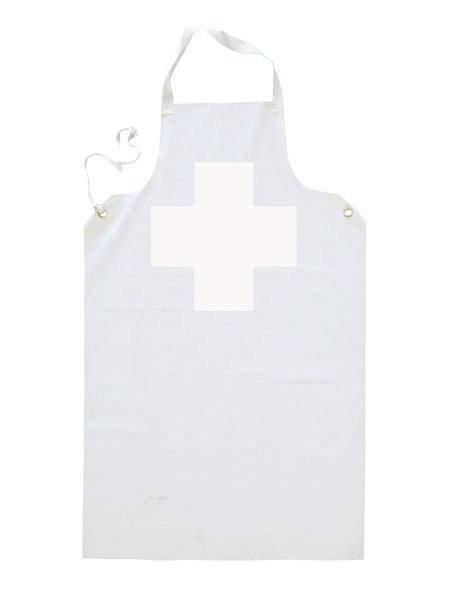 The apron of the 21st century is an attitude, which might be represented by a piece of fabric. It’s however more than just that. The New Apron is free from fear. It is a piece of free choice worn out of love. It shows we love what we do. It shows care and a creative attitude. With this New Apron we are not working to get something, but we are creating to give something. The New Apron protects us from what we want and encourages us to add value. The New Apron is a concept. An indulging in the beauty of being. An awareness more than a piece of fabric to wear. Instead of the old economy approach to first create wealth to achieve wellbeing, with the New Apron we act out of inner wellbeing, which in return leads to external wealth. This New Apron might soon become a verb ‘to apron’, to be of service, to add value, to work because you like to get your hands dirty. Make things because you love the creative process of shaping. A being in love with the making. The DIY. It announces the end of the consumption society, as we know it, in the West. This New Apron shows a sign of sanity and a redundancy towards purchasing more of the same goods that bring no good. We are ready to roll up our sleeves and do it ourselves. We realise, maybe for the first time in our history, that we are co-creating the world together. We move beyond a personal survival and gathering mood into a community of sharing and caring. We enter a world of abundance with infinite possibilities, when we stop searching for wellbeing in the wrong places.